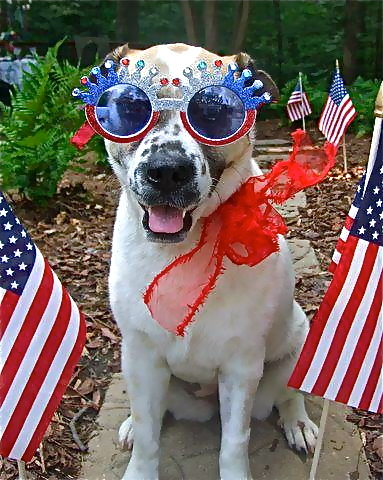 I hope all of y’all are having a wonderful fun-packed 4th with family and friends. College son is making a visit from school to the mountains for a small Summer School break. More excitement for the Parker family—a new nephew born on July 1st! Happy birthday William Harrison! Here to start your 4th off right is the cutie pie Lucy in full Holiday attire—Lucy needs her own card line. Thank you Holly Kerr for the wonderful picture of Miss Lucy! Happy July the 4th from Lucy! Oh my goodness! Hilarious and cute all at the same time! 🙂 Enjoy your weekend with your son and congrats on the new nephew. How sweet! Thank you Kelley! Hope you had a wonderful holiday! Thank you Holly and Miss Lucy! And the same to you Cindy! Lucy looks adorable! She looks like my Beau proud to look goofy! Lucy loves to dress up for the holidays!